When traveling to a specific country, region, or city there are spots that are known for their grandiosity, fame, greatness, and/or beauty. Because of these unique traits they possess, they easily stand out among the other elements in a landscape, leading the viewer to quickly spot them, and immediately know where he or she is. In other words, this feature is called a landmark. Tourists are known to congregate around landmarks because they’re often suggested as a destination to visit by both locals and other travelers who have already been there – but what makes a landmark so iconic? Whether it’s a building, park, mountain, or statue, perhaps these landmarks acquired their prestige by playing a part during an important fragment of history, created by world-renowned figures, or for simply possessing a breathtaking presence. Japan, having been closed off to the world for hundreds of years during the Edo period, offers a peek into its once-private past with historical treasures that still stand today. Having had a culture so concentrated now open to the world, tourist groups flock to see the beauty of each island and prefecture that was kept from the world for so long, as well as the beauty that the Japanese continue to create. Landmarks come in all shapes, types, and sizes. Some of these attractions are incredibly profound and become the signature representation of the company, much like how the Eiffel tower is so well-connected with Paris. However, whether you’re in Japan, or another country thousands of miles away, there will always be other lesser-famous landmarks that exist and carry their own stories, even if they’re not on top of everyone’s to-see list. That doesn’t mean that they’re not as fun to visit – in fact, less popular landmarks can be just as breathtaking as the most famous ones. It’s all about how you properly set yourself up to appreciate it, and this article will offer you a guide on how to do just that. To truly appreciate a landmark, you must first brush up on all the history of it. You can do this by preparing beforehand; read the necessary books, leaflets, and brochures about this certain landmark – or if you don’t want to spend, take some time to do in-depth research online about it. This way, the area you’re visiting becomes even more meaningful as you process the richness of the stories that once took place there. With the internet at our fingertips, it becomes tempting to go to a place, take one look, snap a photo, post it online, and leave. Though your photo may get a few likes, this cycle will hinder you from truly enjoying your experiences. Instead, take some time to notice the details of the landmark, such as the colors, elements, texture, atmosphere, and uniqueness. Ask yourself how the landmark made you feel when you saw it, and what your favorite aspect of it is. Most importantly, keep your phone and other distractions in your pocket as much as possible to truly let you really immerse yourself there. When planning a trip, set aside at least 20 to 30 minutes per landmark of an area to really get to know it. Try not to rush visiting as many as you can; only taking a glimpse of one just to run to the next. You just might end up not remembering any of them at all. The best solution is to carefully create an itinerary that maximizes both your time and the route you will go about, without compromising the amount of time you spend in each area. Now that you know how to make the most out of visiting a famous landmark, here are 7 awesome landmarks around the entirety of Japan (not just Tokyo) that you should consider adding to your itinerary of places to visit. Measured to be 3,776.24 meters high, Mount Fuji (written in Japanese as “富士山”, pronounced as “Fujisan”) is listed to be a member of the “Three Holy Mountains”, an ultra-prominent peak, and the highest peak in Japan. Located in Honshu island’s Chubu region, this stratovolcano is known to have been first ascended by a person named En no Odzuno as early as the year 663. It has been declared as a Cultural Site on UNESCO’s World Heritage List as of 2013, having been the source of spiritual and artistic inspiration for countless historical Japanese figures. You can experience Mt. 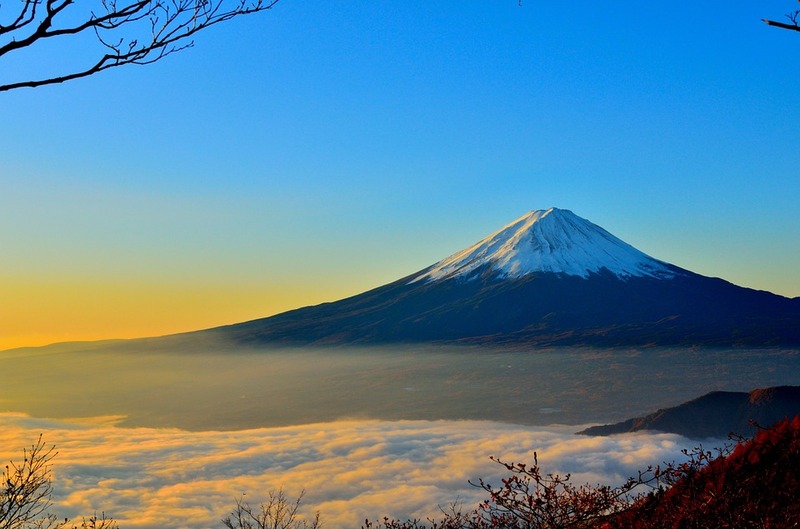 Fuji by grabbing a view of it from a Snow Resort or by the Fuji Five Lakes, or you may scale a part of Mt. Fuji itself. There are different trails that you can try out, offering several altitudes and hiking times. Note that you can only trek these trails during the climbing season, which generally begins around mid-July until early-September. Admission fees usually cost around 1000 yen per head to hike up. This mountain range, which consists of several collections of mountains, namely Kiso Mountains or “木曽山脈”, Hida Mountains or “飛騨山脈”, and the Akaishi Mountains, is another major Japanese landmark, as it splits the main island of Honshu, encompassing a total of four prefectures. These prefectures, Gifu, Nagano, Niigata, and Toyama, hold lovely cities that sit at the base of the Japanese Alps – known as Nihon Arupusu in Japanese, written as “日本アルプス”. Touring packages to not only hike parts of this mountain range, but also experience the sights, sounds, and culture of these cities, are readily available to those interested. In a span of 6 days and more, you will get to see and travel to 7 different cities; Toyama, Omachi, Hida, Takayama, Azumino, Matsumoto, and Shijori, seeing first hand what each has to offer – from fun festivals to pristine rivers, to authentic traditional houses and old towns. Called “Kokyo” or “皇居” in Japanese, the Tokyo Imperial Palace now serves as the residence of Japan’s Emperor, thus the reason Tokyo was made the capital of Japan during the Meiji period, as the capital was customarily declared wherever the permanent residence of the Emperor was. The Tokyo Imperial Palace sits in Tokyo’s Chiyoda ward, in the same exact location of where the Edo Castle once existed. During Japan’s Edo period, the Tokugawa shogun stayed in Edo Castle for as long as their clan reigned – from 1603 to 1867, while the emperors who reigned during those periods stayed in Kyoto, the old capital of Japan. When the emperor overthrew the shogunate during the Meiji period, many parts of Edo Castle were torn down to make way for the new Palace. Though many parts of the palace were destroyed throughout time by war and natural disasters, you can still visit the Nijubashi bridges, as well as partake in guided tours. These tours only occur outside the buildings. To get to the Imperial Palace, take a train to Tokyo Station, and go for a 10-minute walk to your west. Shintoism is one of Japan’s main religions, alongside Buddhism. Scattered around the country are many Shinto shrines, however, the Fushimi Inari Shrine is one spectacular sight to behold. 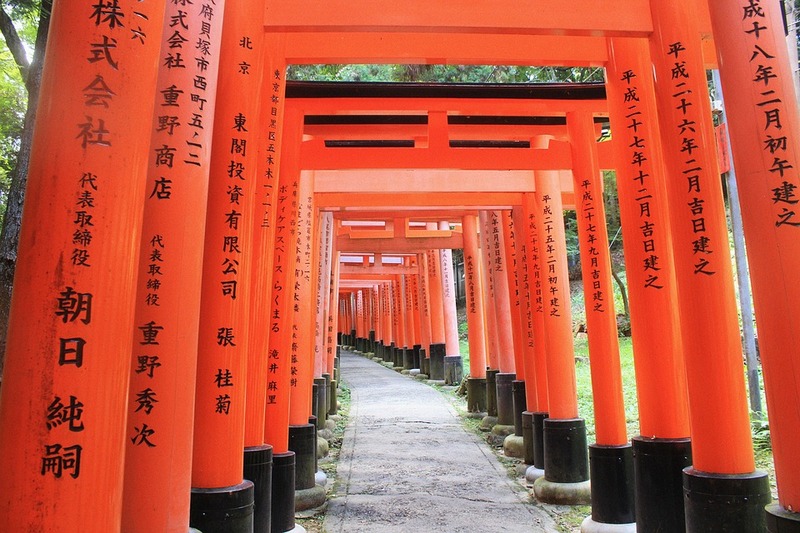 Locally known as “Fushimi Inari Taisha” or “伏見稲荷大社”, this shrine, nestled in Kyoto, is famous for its tunnel made of countless successive torii gates (they are special Japanese gates that you find when you enter a Shinto shrine, representing the crossover to holy grounds). These gates have a bright vermilion hue to them, holding inscriptions on each pole. Towards the ends of the poles are black-painted bases, or “nemaki”. Instead of leading to a shrine, thousands of this consecutively arranged torii lead to a forest – that of 233-foot-tall Mount Inari. This revered mountain, as well as the sacred forests surrounding it, are also considered part of Fushimi Inari Shrine. When you visit, not only can you hike up the mountain, but you can also bask in the beautiful architecture and wondrous colors that the gates and shrine bring. Kinkakuji – or more popularly known among tourists known as the Golden Pavilion, exists as a Zen temple. With its two upper floors adorned in pure gold leaf, the structure wasn’t initially intended to be a Zen temple, as shogun Ashikaga Yoshimitsu was supposed to retire here. In 1408, Ashikaga Yoshimitsu passed away, and only then was it transformed by the Buddhist Rinzai sect into a temple. Later, Yoshimitsu’s grandson would create a pavilion that takes strikes a resemblance to this temple, albeit a humbler one. The structure is not the original one – it was built in 1950, as the temple had been burned down on several occasions throughout the centuries. This landmark is the favorite of many tourism promotions as its attention to detail and dedication to Japan’s aristocratic past is flawless. Want to visit? The address of this temple is 1 Kinkakujicho, Kita, Kyoto, Kyoto 603-8361. To get here, simply take Bus # 101 from Kyoto Station. With history, politics, religion, and nature off the list, a more entertaining and special landmark that Japan is famously known for is Jigokudani Monkey Park. Jigokudani Monkey Park or Jigokudani Yaen Kōen (地獄谷野猿公苑) is just one aspect of the Joshinetsu Kogen National Park, or “Shigakogen”. This area can be found in Yamanouchi, in the Shimotakai District of the Nagano Prefecture. The adorable Japanese macaques – also known as snow monkeys - inhabit a portion of the valley, visiting this park to enjoy the “onsen” or hot spring baths during cold months – making for a picturesque and unique view for tourists. These monkeys are not in captivity, instead, they choose to come for free food all-year round, as the monkey park attendants continued to feed the macaques. They retreat to the forest at their own will and can often be mischievous with any curious visitor. Last, but not the least, is the landmark very often associated with the idea of Tokyo in Japan – Shibuya crossing. This scramble crossing is depicted in many movies (Lost in Translation, Tokyo Drift, The Fast and the Furious), as the scenery is vividly accompanied by vibrant colors on large television screens plastered on the buildings. 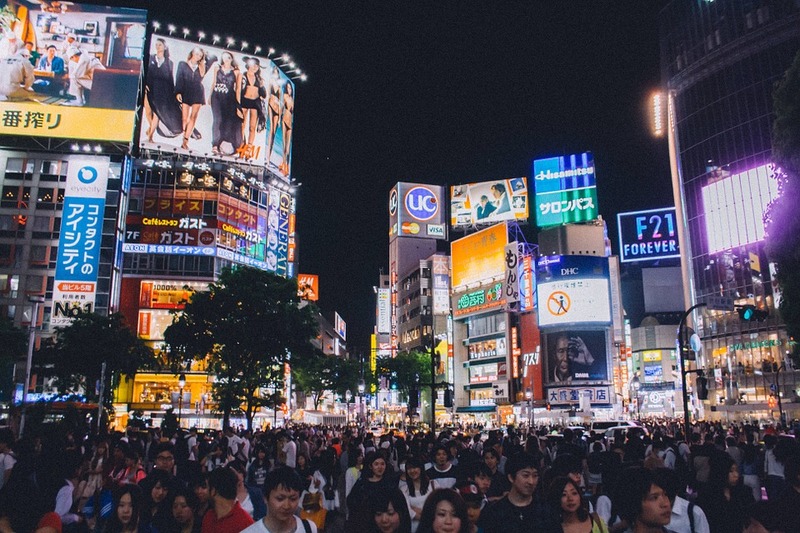 Rumored to be one of the busiest intersections of the world, Shibuya crossing takes on as many as 2,500 people crossing the street every time the lights turn green for them. Now that’s a number that’s worth a shot – both in terms of photography and visiting the landmark. Other notable landmarks include the Hachiko Statue, Himeji Castle, Nagoya Castle, Osaka Castle, the Arashiyama Bamboo Grove, Dotonbori, Nara Park, Hiroshima Peace Memorial, and Tokyo Tower, among many others. Headed to Japan soon? Make sure that you visit at least one landmark to make the most out of you travel – be it one of the less popular landmarks, or one that you just learned about through this article.